Around 8:40 on election night Tuesday, Fox Chicago called the Illinois 9th congressional district for Jan Schakowsky. The Democratic incumbent congresswoman was sporting 65.4 percent majority over Republican challenger Timothy Wolfe at the time, with over 70 percent of precincts reporting, so the decision was far from rushed. Yet cheers for the dominant showing were subdued at Schakowsky’s victory party in Evanston, if they were present at all. After all, the guest of honor had departed an hour earlier. Rather than revel in a victory that granted her an eighth consecutive term in the House of Representatives, Schakowsky offered a short statement of gratitude and encouragement to an audience composed mostly of staffers and colleagues, before heading out to President Obama’s reception at the McCormick Place in downtown Chicago. She barely touched the topic of her own re-election. “I’m very hopeful my election will go just fine,” Schakowsky added at the end of an approximately two-minute long address before departing to celebrate a far more hotly contested race. “I’ll be mad if we don’t get 70 percent” said one party attendee to another. As of Wednesday morning, reports indicated that Schakowsky’s supporters will have to make due with 66.1 percent. Rep. Schakowsky actually cleared 70% of the vote in her first six Congressional elections, and the 66.1% represents one of her weakest showings, despite the lack of political experience of her opponent. Yet her campaign does not see this as reason to think her string of overwhelming victories is coming to an end soon, especially not on a night filled with Democratic gains. More blowouts like Tuesday’s can certainly be expected for Schakowsky if she continues to enjoy fundraising advantages like the one she held over Wolfe in the 2012 campaign. According to OpenSecrets.org, the more experienced Schakowsky organization raised over $1.2 million, whereas Wolfe, a CPA entering into politics for the first time in response to a vacuum of Republican candidates, failed to eclipse $50,000 in total campaign contributions. That financial advantage contributed to a campaign that overcame an endorsement from the Chicago Tribune, which backed the Republican Wolfe ans praised his “fiscal restraint.” But to Schakowsky’s campaign, the ease of Wolfe’s defeat testifies to the irrelevance of endorsements from the famed newspaper. An unchallenging rout back to Washington allowed everyone to move quickly away from campaign-related drama. 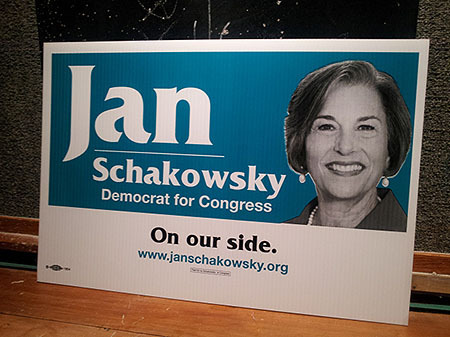 For Tuesday night at Prairie Moon, that meant tracking and cheering for other races across the nation while campaign signs reading “On our side.” sat idly against walls and on tables, but it also allows for Schakowsky’s staff to look forward to getting back to work in Washington.